Fall is here, the leaves have started changing and the weather is cooling down. It is my absolute FAVORITE time of year! One of my favorite things about fall is drinking Sparkling Cider. I adore Sparkling Cider and have recently been finding that I LOVE to cook and bake with it too! It adds such a yummy flavor to recipes. I don’t know about you, but sometimes when drinking Sparkling Cider, I find there always seems to be a cup or so that my husband and I don’t finish right off the bat. This is a great recipe to use up that extra little bit you might not have finished. Kristian Regale so kindly sent me a few samples to test out in some recipes. As soon as my package arrived, I sprinted to my kitchen! I couldn’t wait to test out the flavors out! Kristian Regale has a WIDE VARIETY of flavors including; apple, pear, peach, pomegranate-apple, black currant, lingonberry-apple, lite-apple and lite-pear. Seriously, do these flavors not get your mouth watering?! With peach season here, I knew I wanted to do a yummy recipe involving the Kristian Regale Peach flavor. I used it in this yummy Peach Cobbler dessert and we all really enjoyed it! The sparkling cider really adds such a great flavor to this simple recipe! Dump the two can of peach pie filling into the bottom of a 9x13 pan. Evenly sprinkle box of yellow cake mix over the top of the peaches. Slice butter into extremely thin slices and evenly place on top of cake mix in a single layer. Evenly pour cup of Kristian Regal Peach Cider over the top of the butter. Bake at 350 degrees F for about 45 minutes or until top is golden brown in color. I love sparkly cider too! This recipe looks pretty easy to make and SOOO good. Can't wait to try it. I still want to make your sparkling cider pound cake - now this!! 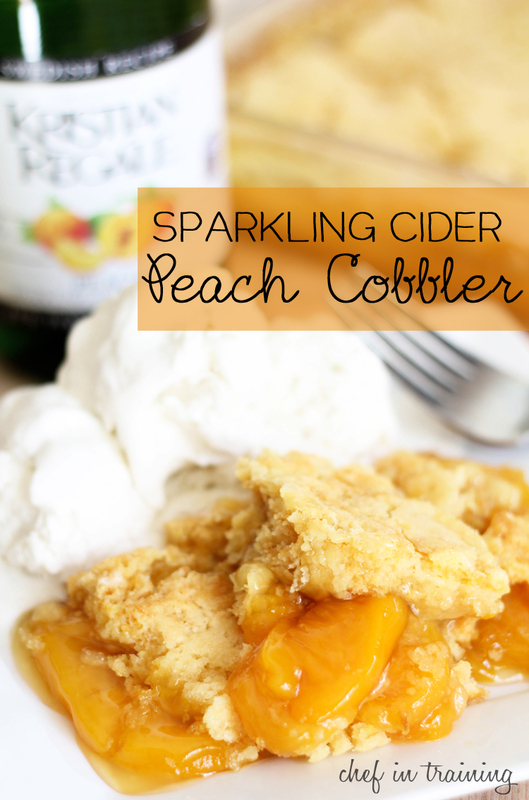 Nikki...The cobbler looks amazing and I can't wait to try it; I'm in Maryland...where would I find the peach cider used in this recipe? Even though I'm not a huge peach fan, this cobbler looks fantastic! And I love it's so easy! You can find this brand of sparkling cider at IKEA- that's where I bought it!